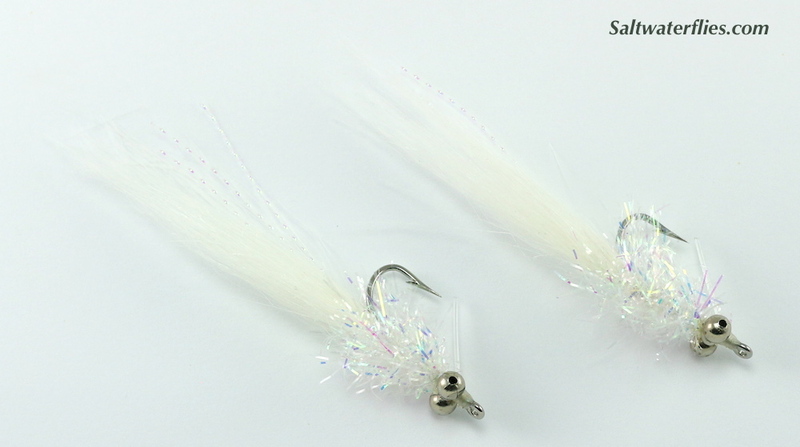 Saltwater Flies! 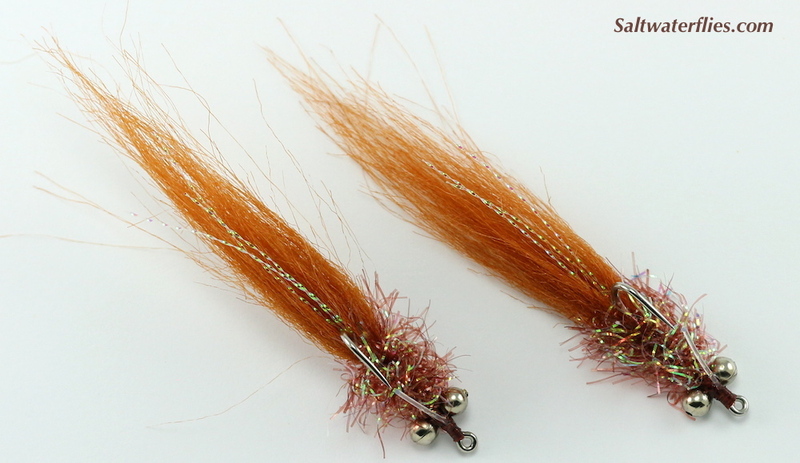 SALTWATERFLIES.COM -- The finest saltwater flies and tying materials for your saltwater fly fishing. In the middle of a boiling striped bass and bluefish blitz off the coast of New England...Casting to bonito ripping up bait in an inlet...Searching for seatrout and reds amidst the windswept beaches of the Outer Banks... Hunting huge snook and tarpon in the tangled mangroves...Stalking wary bonefish over the pristine flats...Searching the bluewater eddies of the Gulf Stream for tuna, marlin, and sails. In these magical places, and many others, the saltwater fly rodder plys his trade. In his hand, the coiled line, stripping, stripping, ready for the strike. At the end of the line, a fly; a feathered hook to tempt the most awesome denizens of the brine. 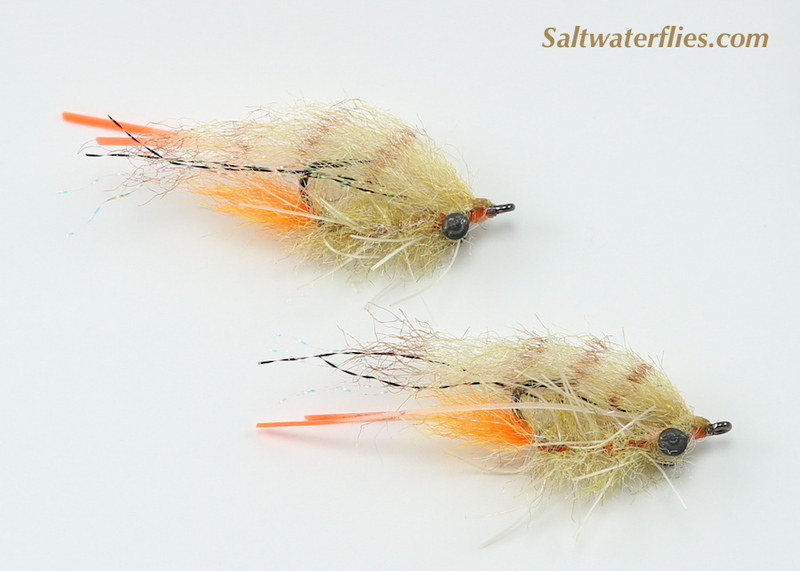 Saltwater fly fishermen experience the most profound enjoyment of their sport, and Saltwaterflies.com is dedicated to helping you with the best saltwater flies for your next trip, and high quality tying materials to help you enjoy your time at the vise, creating beautiful saltwater flies. The Flash Minnow is a simple, effective fly, and easily one of those "top 10" kinds of patterns that make it into our boxes for just about every saltwater trip we take. Snook, tarpon, redfish, bonefish, striped bass, seatrout - all of these species and more have been taken on the Flash Minnow style over the years. This is such a classic pattern, with soft tail materials for great breathing action in the water, and bright body to catch the attention of active gamefish. Lightly weighted with bead chain eyes and just great for fishing in shallow water, mangrove, marshes or backcountry; includes a single monofilament weedguard which is easily clipped off for fishing open-water areas if necessary. Colors: White Pearl, White Pearl & Orange (shown above), Root Beer Pearl, and Chartreuse Pearl, Chartreuse Pearl & Orange. Order at these links, or click the photo above to go to the Flash Minnow page. Meiho's two-sided box lined with slit foam makes the most of the space inside - Meiho calls this their "Rungun" case, but we'd probably call it the "Grab-n-go"! On a recent bonefishing trip, we took just this one box while wading away from the boat... this box will easily hold 72 standard size bonefish flies, possibly even more if you maximize use of the space. Outside dimensions of the box are approximately 7 1/8" x 4 1/8" x 1 1/2" (18.5 cm x 10.5 cm x 4 cm). 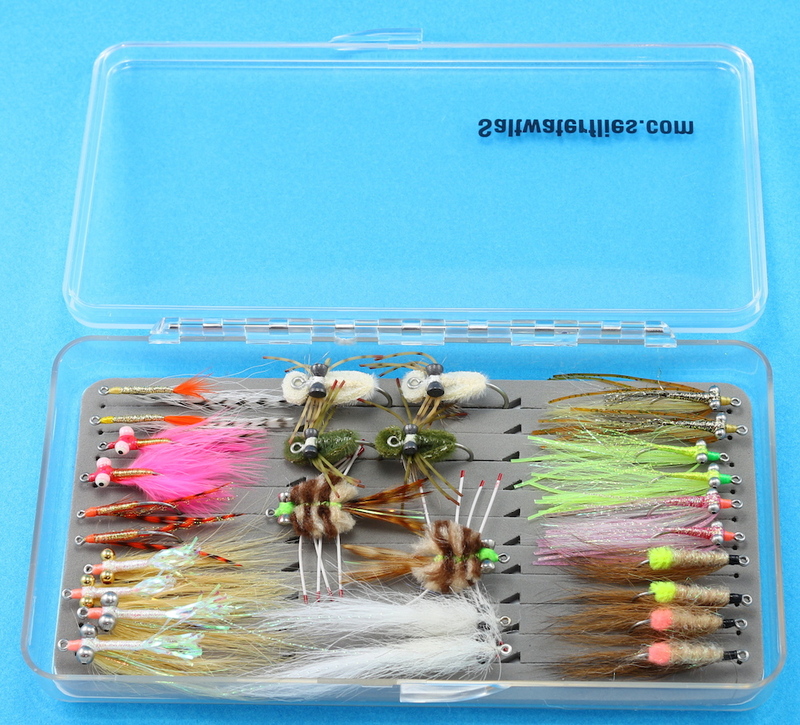 This box is ideally suited for most bonefish flies, but will also hold small streamers - this is a hell of a good box for the river too. Stainless steel hinge pins and well designed latches round out this excellent box. More photos are shown on the "Fly Fishing Accessories" page - see link at the top of this page for all of those products. 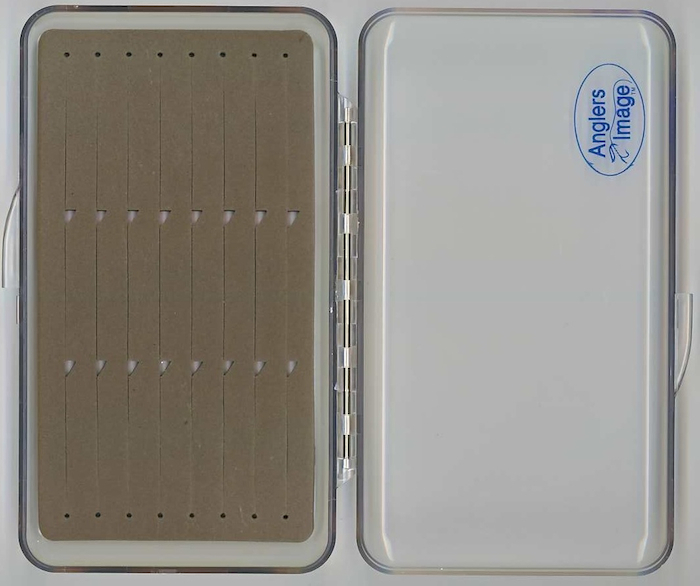 The slim-profile "Bonefish Box" by Anglers Image shown in the photo below is one of the finest boxes we have ever found for carrying standard bonefish patterns - modern "slit foam" design holds flies securely and is easy to insert the flies in. 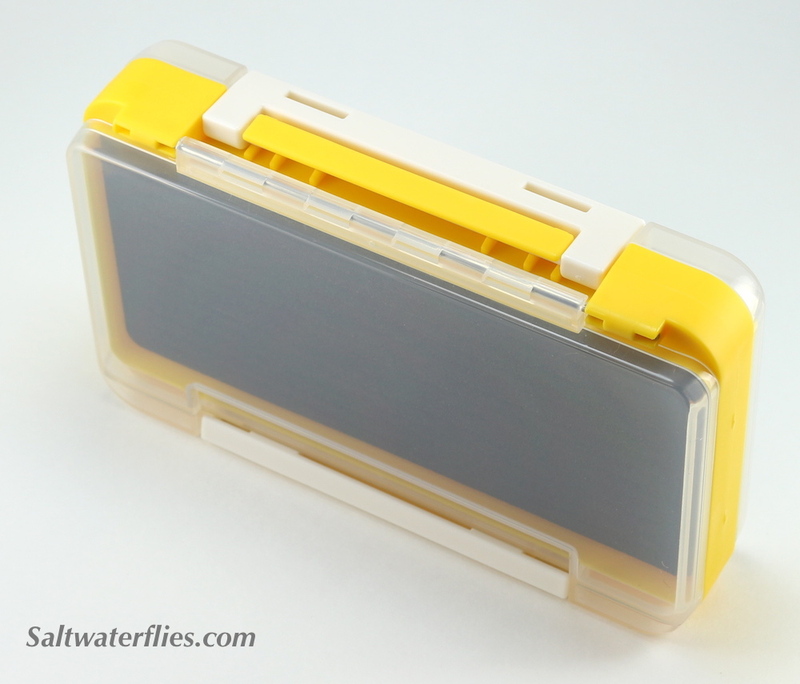 This box will hold approximately 24 standard sized bonefish flies, but still fits easily in a shirt pocket - something that many boxes are advertised to do, but few achieve. 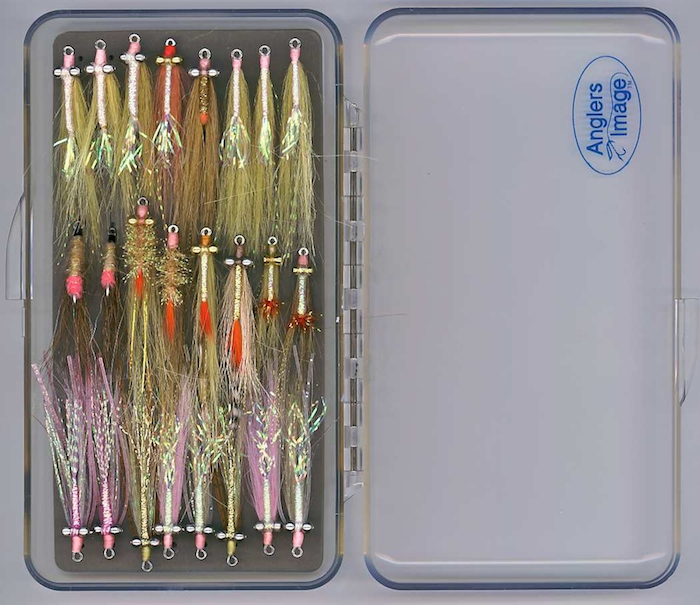 The lid of this box is clear, which allows the angler to view the contents of the box before opening it - a real advantage as it minimizes fumbling while wading the flats or preparing to tie on a new fly from the deck of a bouncing boat. Dimensions are 5 3/4" x 3 5/8" x 7/8" (14.5 cm x 9 cm x 2.2 cm). Click photo shown below to view the box empty. 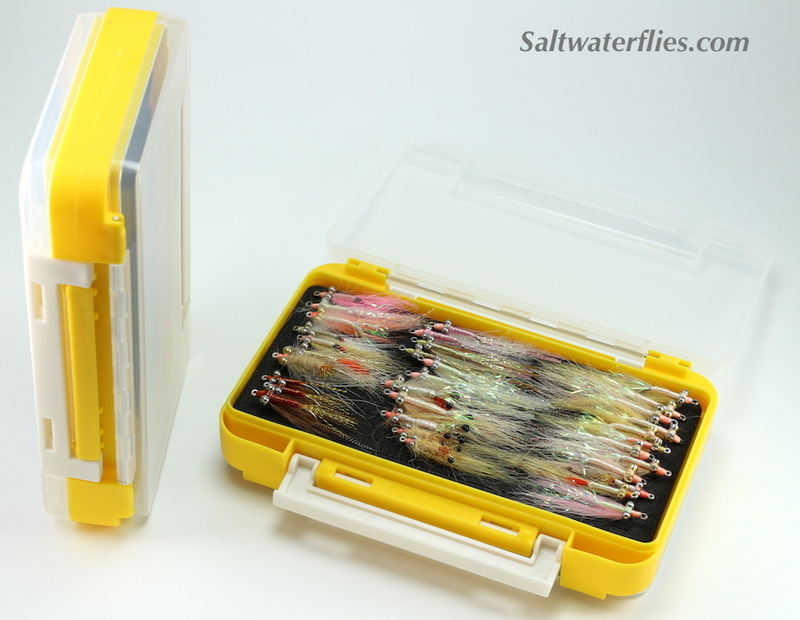 Also available is the "Big Bonefish Box" (second photo) - this box dimensions are 7 3/8" x 3 7/8" x 1 1/8" - this larger box will hold up to 3 dozen standard bonefish flies when neatly arranged, and also has a bit more headroom for larger flies like crabs & sliders, etc. Both of these boxes are priced the same, and both are in stock now. We can assemble fly selections similar to those shown these boxes. If you wish to order a selection of flies for your fishing, please call or e-mail us with details about where you plan to fish, and we can tailor a selection to suit your needs. 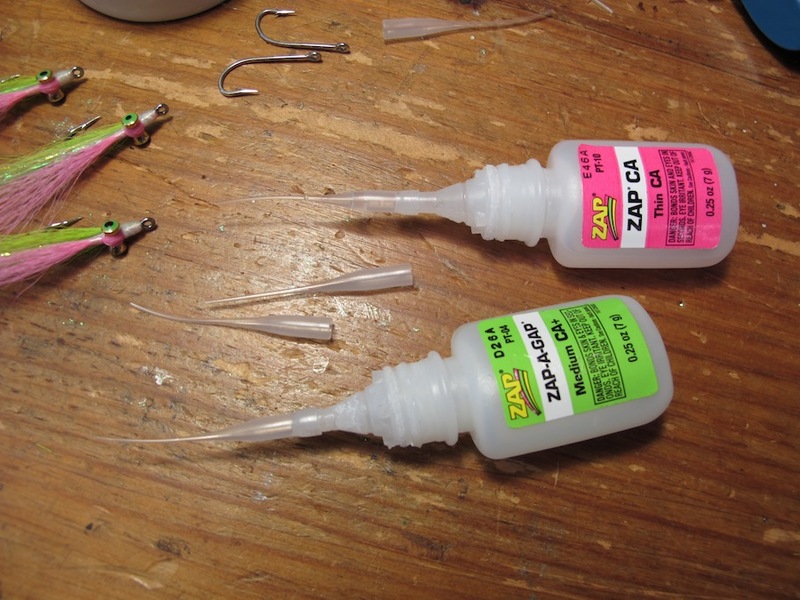 These days I'm often using one of the ZAP "super glues" to increase the durability of my saltwater flies - a quick hit on the thread wraps here and there makes the flies really tough! The green label stuff that we sell is basically all-purpose, and can even be used as a "head cement" to finish the fly. Anyway, the "trick" offered here is that ZAP offers what they call their "Extender Tips" or "Flexi Tips" - a very fine plastic nozzle tip that can be put on the super glue bottles, and left like this on the bench during tying - there's no need to keep putting the cap back on, as the nozzles can be left on for days without clogging. The "Zap A Gap" that we sell now comes packaged with these tips. I do keep a small rag handy to quickly clean up any spills and to keep the extender tips clean. Capt. Tom Rapone brings us the excitement and madness of the spring squid run on Martha's Vineyard! Go to our Fly Tying Catalog! Flies, flies, and more flies. Browse our collection of hand tied saltwater flies. Everything for the Saltwater Fly Tyer!. See some of the unique and special flies that we have collected over the years. View some of our favorite photos from recent fishing seasons. 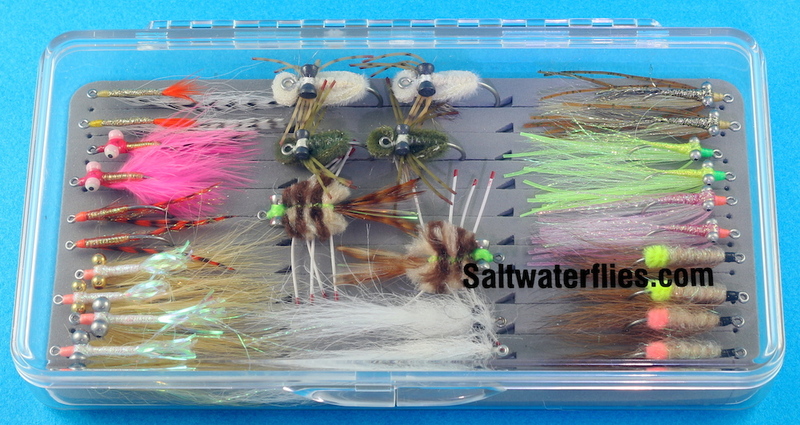 Questions and comments about saltwater fly fishing, or SaltwaterFlies.Com. The Good, the Bad, and the Ugly. A collection of wonderful photographs submitted by our viewers. -- Some Of Our Other Viewer Submitted Photographs -- Kolt Johnson of Florida with a nice Seatrout Raffaele Mascaro, Giuseppe Re and Flavio Bideri in the Maldive Islands Jeff Pierce's Yellowtail Snapper Theo Bakelaar of Holland with a nice Striped Bass Jay Tinsky and friends at Harker's Island, 2002 John Morin's Feather Brain, Sponge Bob, and Lobster flies John Morin's Crab Apple and Flounder Around flies Bruce Roberts' Blue Fin Trevally & Jason Stenzel's Barracuda Fabrizio Mioletti's Bullet Tuna Peter McCarthy's Striped Bass and False Albacore Richard Tremblay's 40 Pound Flyrod Striper! Let us guide you to some of our favorite sites on the World Wide Web. Meet the friendly folks who bring you Saltwaterflies.com.